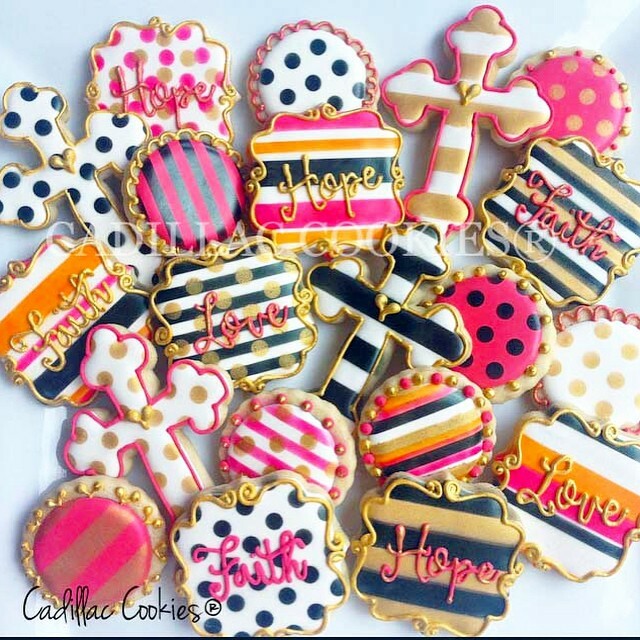 The Silhouette is becoming increasingly popular with cookie and cake decorators. 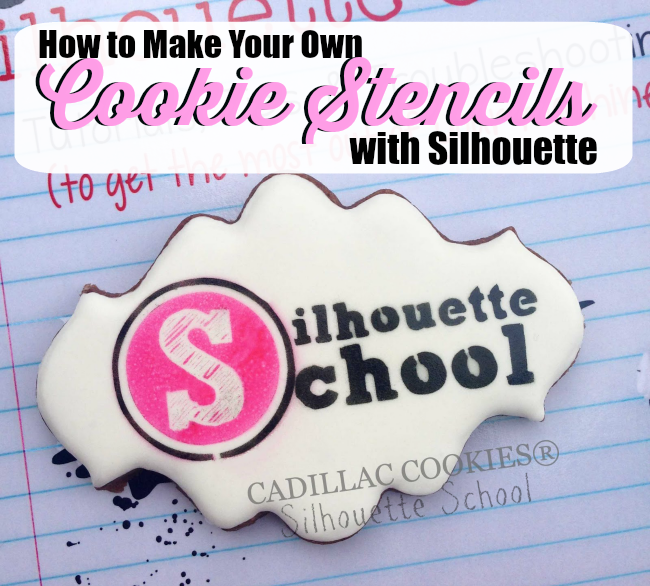 I've shared a few lessons in the past about how to cut sugar sheets with Silhouette CAMEO and how to sketch and cut with Silhouette and food safe markers, but today we're going one step further to create perfect cookie stencils with Silhouette. I have no skills in the cookie baking department, so today I'm teaming up with the extremely talented Laura from Cadillac Cookies. When I say extremely, it's pretty much an understatement if you go by her mad skills displayed on her drool worthy Instagram page! Laura is a Silhouette owner too and she's finally figured out how to make stencils for decorating cookies, by cutting food safe stencil material (like Acetate sheets) on her die cutting machine. Stencils make for MUCH easier cookie decorating, especially when the design is very detailed or a background pattern. 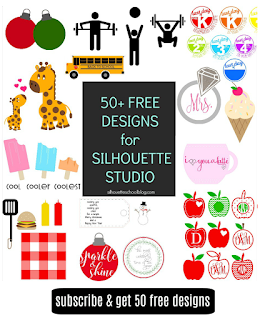 To make your own cookie stencils with Silhouette, start by opening up Silhouette Studio and opening up your design. 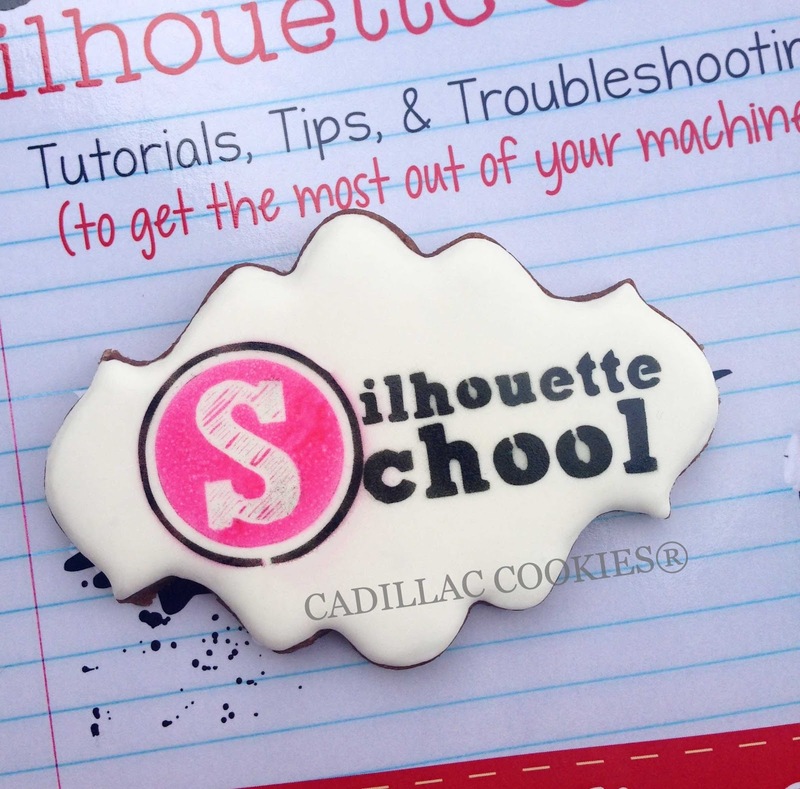 For this example we're using the Silhouette School logo because...well, just how cool is that?! You can see that the o's and e's don't have any counters (that's the official world for centers or cutouts). 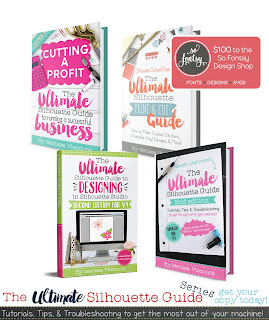 But by using the erase or knife tool, as I explained in this tutorial on how to make 100% better stencils, I can quickly and effectively turn this design into a more stencil friendly design. Simply by removing a very tiny section of the e and o (in the circled areas) it 'bridges' the counter to the rest of the stencil so they don't fall out leaving you with the above result - but instead an ideal stencil. 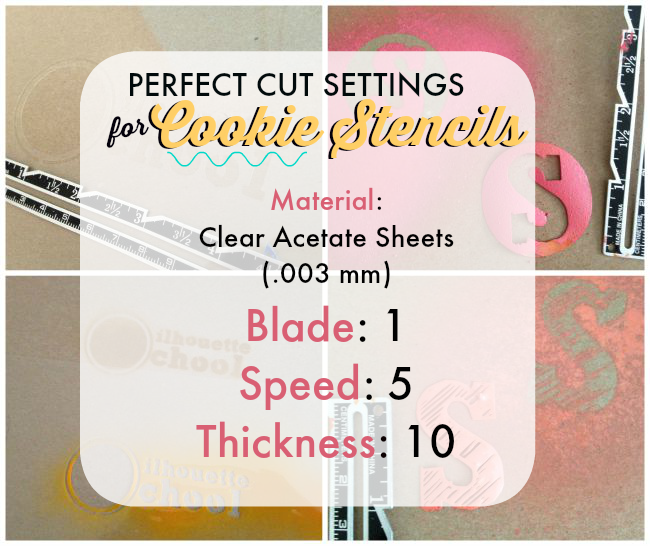 Note: Be aware that if you are cutting food stencils on your Silhouette CAMEO you should keep a blade and mat exclusive to these materials. Also, if you have really small and detailed areas you may want to slow the speed down slightly. 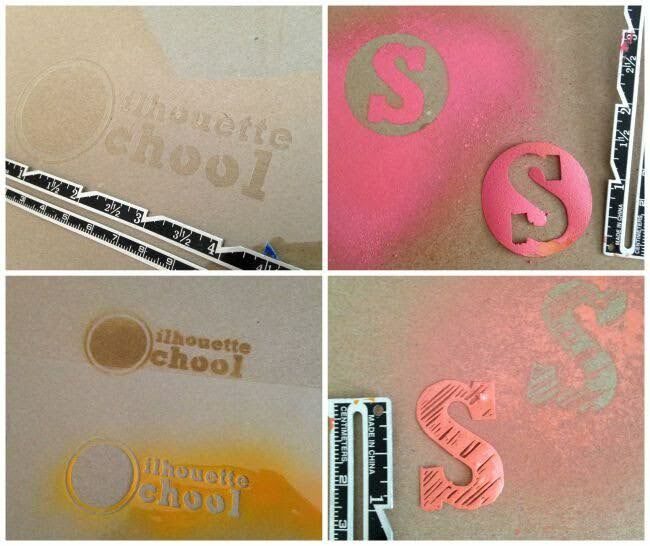 And here's how the finished stencil looked before removing it off the mat. Once the stencil is cut, remove it from the cutting mat and weed it. You want a lot of excess acetate around the stencil so don't be stingy when cutting (or skip cutting around it all together)...cut wayyyyy out and around giving yourself at least a few inches on all sides of the stencil. Now comes the tricky part - getting that perfectly airbrushed stenciled cookie look! Since I don't have all this fancy schmancy cookie decorating equipment like an airbrush gun and compressor I tested on cardboard with spray paint. As you can see it was a perfect stencil every single time - even in the most detailed areas. So with that...Laura got to work on some actual cookies. 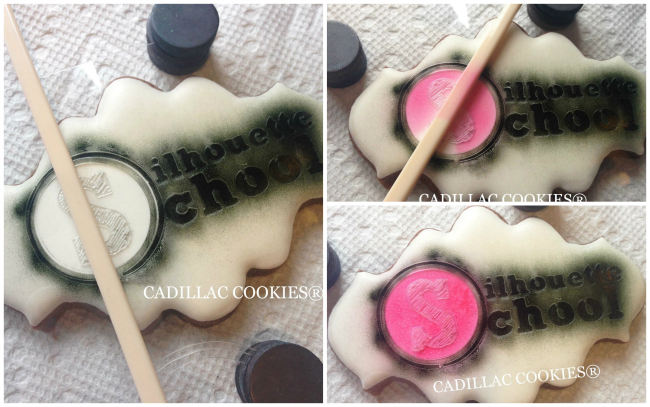 She ices her cookies first so she has a nice even (and delicious base) to airbrush on. 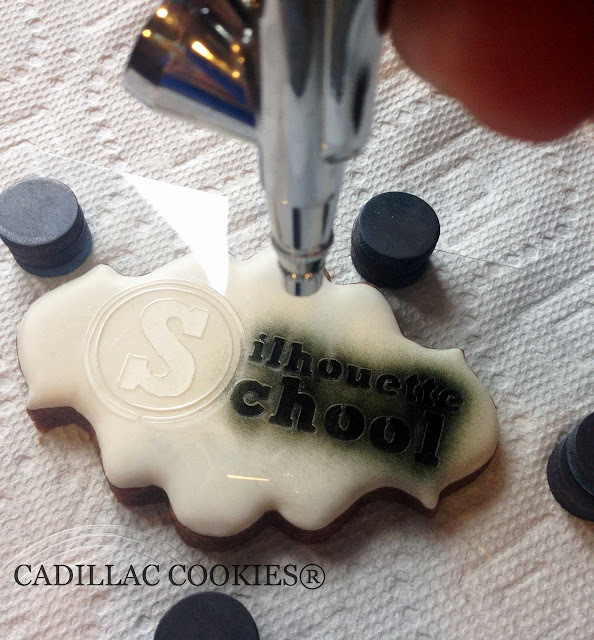 To hold the stencil in place while airbrushing, she uses a technique using magnets, which she picked up from Callye at Sweet Sugarbelle blog. So as not to re-invent the wheel, simply flip over a cookie baking sheet. You can cover the back side of it with a paper towel if you want to protect the backside of the cookies. 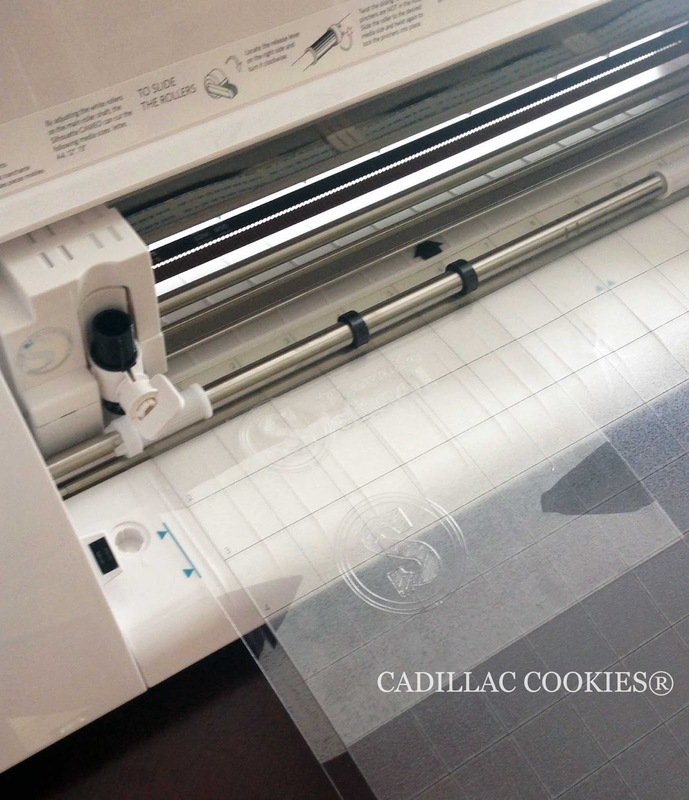 Place the cookie onto the paper towel and lay the stencil on top. Now to keep the stencil in place, use four large magnet, one on each corner of the stencil to hold it into place. The magnets will stick to the cookie sheet and keep the stencil in place. Now you're ready to start airbrushing the cookies! Laura started by airbrushing the black areas. But Laura got around that by using a chopstick to help secure the "S" in place, so it wouldn't blow away when she was airbrushing the pink area. And so my stenciled cookie-loving friends, that's how you cut DIY cookie stencils using a Silhouette machine. 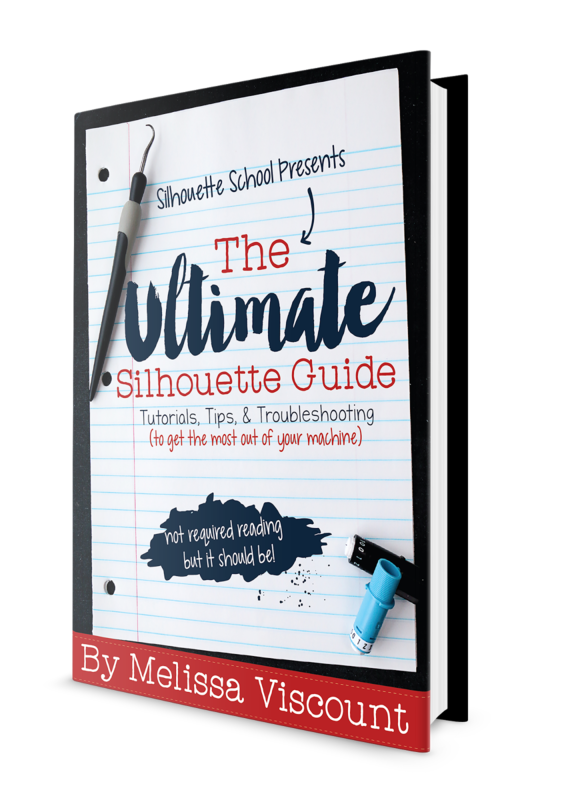 Oh and PS if you're a cookie or cake decorator who's considering getting a Silhouette to enhance your designs and create stencils...my book The Ultimate Silhouette Guide will teach you everything you need to know about the Silhouette software Studio and how to use the machine and materials! You will want to center your stencil on a 5 1/2 x 5 1/2 in square if you use a stencil genie by Creative Cookier. 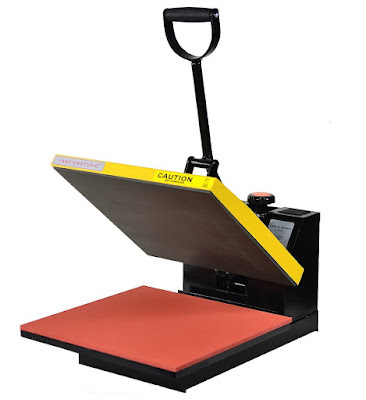 You can get 4 genie sized stencils from a 12x12 in piece of acetate. 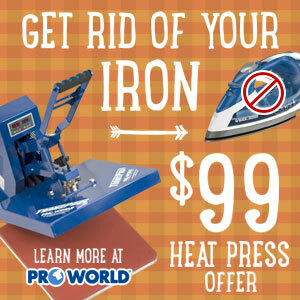 It will fit exactly into the genie and it eliminates the need for magnets since the genie is already magnetized. It is a nice product. I don't think I would be doing that, however, your creativity amazes me. Yes, absolutely awesome! I would never have thought to do this. Ingenuity! Thank you for sharing your talents and a possibility for all of us. 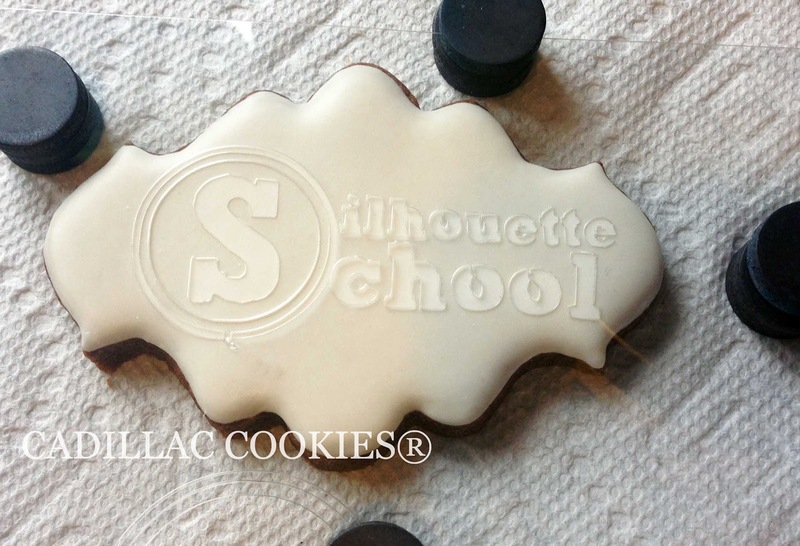 I bought my silhouette specifically for stenciling cookies! I have made over 100 and I love them! 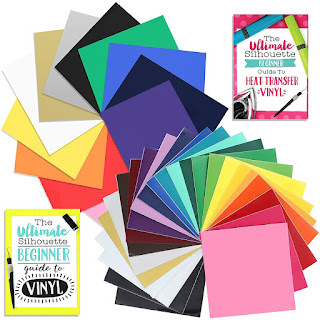 I would have spent over $500 plus shipping if I bought the stencils individually. Wow! I started reading this thinking I would never decorate cookies, and in the end I thought, that's pretty amazing, maybe I could try. 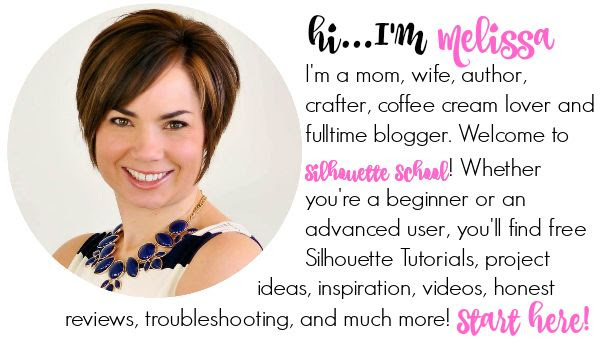 This is perfect for someone like me with no artistic skills (can't even draw stick figures well) but who is great at designing on the computer. Great tutorial! Thank you for posting this! 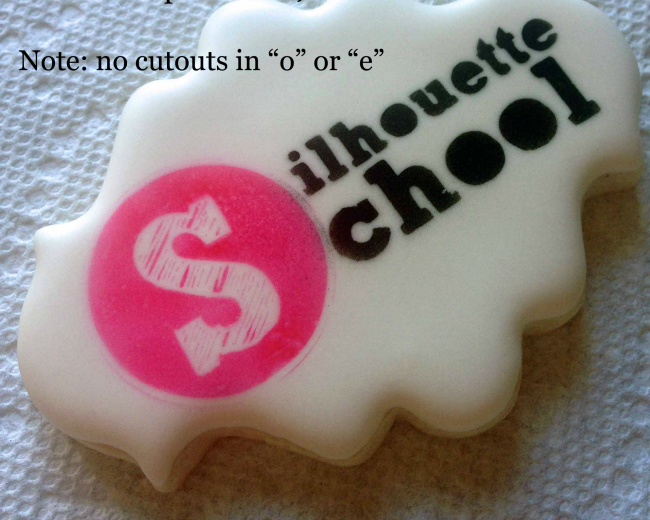 I have just recently started cutting out stencils for my cookies using my Silhouette. 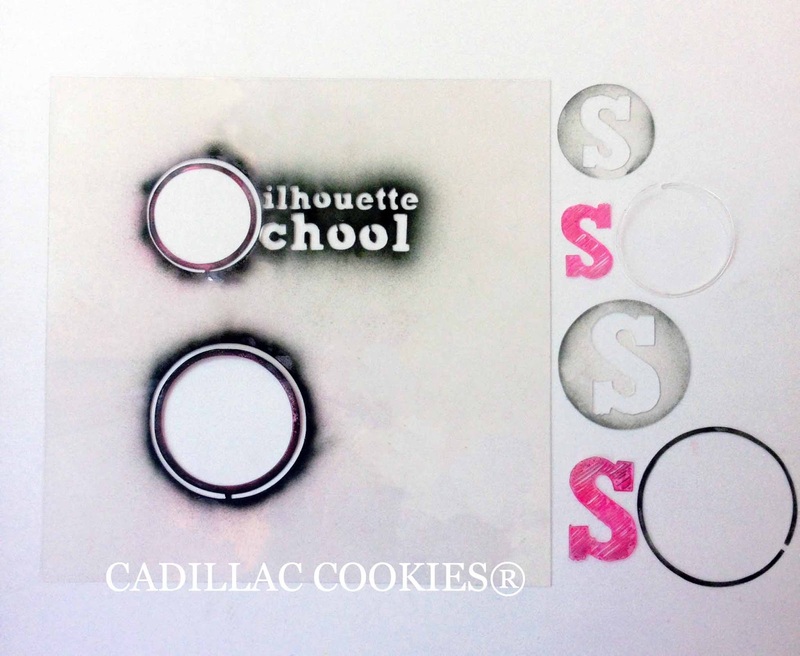 I have one that is giving me trouble and when I searched "stencils" on your site, the first one that came up was this one for cookies!! Abby, do you have any tips for making actual designs or figures on stencils for cookies? I am struggling trying to figure out where to use the "bridges" to hold the pieces together? Thanks for sharing the information. It is very useful for my future. keep sharing. A good blog. I want to give a little list of my favorite game sites. Check it please! I stocked up on .007 plastic, uhoh! I haven't tried it yet. I love the .007 plastic over the .005 plastic that I've purchased for my cookies. I can't imagine using a flimsier .003 plastic?! How do you guys like it? I tried the .005 with 4 different blades and couldn't get it to cut through the acetate even if I double cut. did this and followed the exact settings on the same plastic acetate .003 total fail! 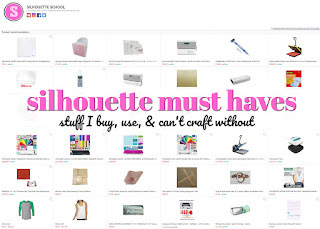 I am new to this Silhouette and wondered why it doesnt cut all the way thru. I used a new blade too. Those cookies are glitzy and glamorous. I couldn't cut through the .005 acetate no matter how many different blades and settings I tried. It etched it but wouldn't cut it. Ugh! I guess I have to get .003. I didn't really want to go that thin but something would be better than nothing I guess. I tried this with the recommended Acetate Sheets from Amazon... the material was so fragile that just moving the resulting stencil caused it to rip to shreds. I'm really disappointed. Is there a more resilient material that I can use?